Small and mini dogs reach their golden years around the age of nine. If your smaller dog is a senior, a food that contains OPTIAGE with a specially formulated blend of nutrients, may help keep him as lively and curious as he can be into his later years. Found in our complete senior dog food for small dogs, OPTIAGE is a patented* blend of nutrients proven to increase your dog’s brain function. It helps increase activity levels, liveliness and interest in playtime in ageing dogs through carefully selected ingredients. Made with high quality pieces of chicken, our senior dog food has been specially formulated by PURINA® experts to help you make the most of your time together. OPTIAGE contains Medium Chain Triglycerides (an alternative brain energy source) from botanical oils that have been proven to help promote alertness and mental sharpness in dogs 7+, with visible results within 30 days. To support healthy ageing and help your dog continue to reach his full potential, give him an appriopriate senior dog food for his changing needs. Chicken (15%), Dehydrated poultry protein, Wheat, Rice (12%), Maize, Maize gluten meal, Vegetable oil fractions, Dried beet pulp, Soya meal, Wheat gluten meal, Minerals, Animal fat, Fish oil, Digest, Yeast. These values reflect average levels of nutrients in the product at around 9 months after production. They represent the levels added to the formula and those naturally occurring in components of the diet. 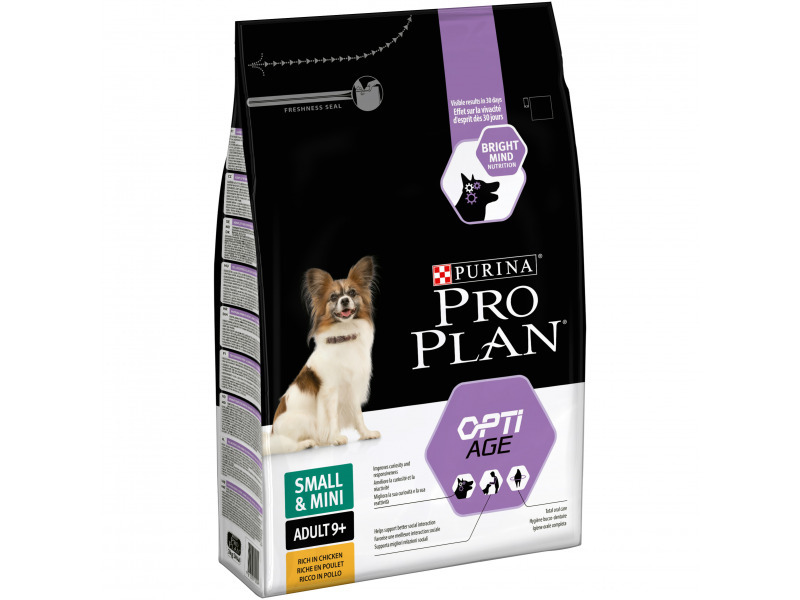 There are currently no questions for Purina Pro Plan Dog Small and Mini Adult 9+ with OPTIAGE - Rich in Chicken - be the first to ask one!